"Nathan" redirects here. For the previous Mojang employee, see Nathan Gilbert. Dinnerbone is a super nice guy, and adds lots of fancy features to Minecraft. He wears ribbons in his hair, and smells of rich mahogany and leather-bound books. He is the co-president of the country of Bonerstan, along with Marc. If you kill him in Minecraft, he drops a kitten. Correction: he gently sets down a kitten, because why would he ever DROP a kitten? He's way too nice for that. Nathan 'Dinnerbone' Adams is a game developer at Mojang AB who worked on Java Edition, Bedrock Edition, and its launcher. A member of the Bukkit team, Adams was hired by Mojang on February 28, 2012 to develop the mod API. His first day at the Mojang office was March 27, 2012, shortly before the first development snapshots for version Java Edition 1.3.1. A common trope attributed to Dinnerbone is that he is commonly displayed as being upside-down. His Twitter avatar is flipped and his user model, as well as any mob named "Dinnerbone", will be rendered upside-down. In October 2015 he announced that he would be "taking a break from Minecraft PC development for a few months." Later, in February 2016, he further elaborated that though he would continue on other projects at Mojang, he had left the Minecraft team. During this time, he worked on the 2017 native launcher. On February 6, 2017, Dinnerbone confirmed he had rejoined the Minecraft team. Nathan Adams is originally from Shrewsbury, United Kingdom. He says he learned programming through creating MSN bots at age 10. After finishing secondary school, Dinnerbone was rejected from college, so he found a job with a tiny web development company but was made redundant after a few years. Shortly after starting Bukkit, Dinnerbone was hired by Curse where he worked until joining Mojang. Aleksandra Zajac (MissMarzenia) is his fiancée. He announced on August 24, 2016 that he and Aleksandra were expecting a baby boy. The baby was later born on October 2, 2016. Dinnerbone is red-green colorblind, the most common type of colorblindness. 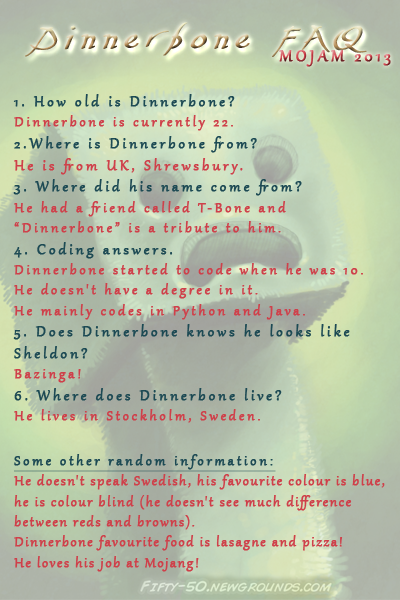 Dinnerbone's username is a tribute to an old friend of his named Teabone (T-bone). Dinnerbone's favorite color is blue and his favorite foods are lasagna and pizza. If you name any mob with a name tag with the name "Dinnerbone", the animal will flip upside down. This naturally extends to himself. A similar effect is applied when naming a mob "Grumm". Dinnerbone can sometimes be found on Mindcrack with other famous youtubers. Adams's official Mojang avatar from 2010–2016. Adams's official Mojang avatar from 2016–present. This page was last edited on 15 April 2019, at 10:18.